It's important to realize that your hormones are some of the most powerful molecules in all of biology. Hormones are responsible for the amount of muscle mass on your body, your gender, how many calories you burn at rest and so much more. 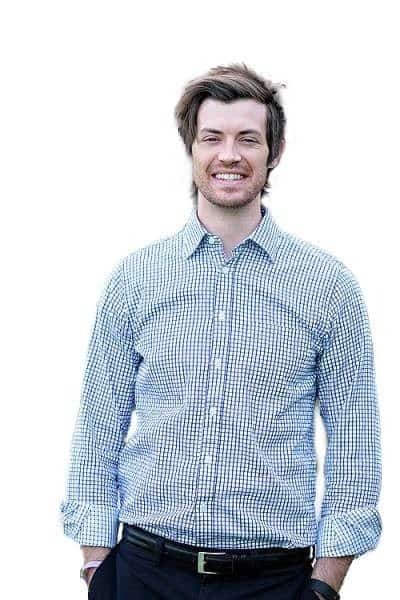 So it just makes sense that you would want these hormones to function at 100%, right? This is the logic behind using supplements to help "support" your hormones. Thyroid hormone happens to be one of the most important and powerful hormones in your body. ​There's a reason that thyroid hormone is referred to as the "master hormone". Because thyroid hormone influences just about every cell in your body. ​The point is that you have at least 6 very important reasons to support your thyroid. But do you actually need thyroid support or is your thyroid "fine" on its own? ​Some health "experts" would have you believe that your hormones are perfectly fine regulating themselves and that they don't need any assistance. It turns out that there are several scientific and documented factors that may be impairing your thyroid function and seem to disagree with this general sentiment. Contact with chemicals and endocrine disruptors -> Endocrine disruptors (also known as EDC's) are chemicals that you come into contact with on a daily basis. These chemicals have been found in plastic containers (drinking water), on receipts from stores and even on plastic kids toys. EDC's have been shown to reduce the effectiveness of hormones at the cellular level (8). When was the last time you touched a receipt or drank out of a plastic bottle? This happens regularly. Nutrient deficiencies like zinc or iron -> Even though we live in "nutrient replete" areas the rate of nutrient deficiencies approaches as much as 50% for certain nutrients like zinc (9). When you consider that zinc is involved in T4 to T3 conversion it's easy to see how small nutrient deficiencies may impact thyroid status in your entire body. Exposure to chronic stress -> Everyday stress takes a serious toll on multiple systems in your body and your thyroid is one of them (10). Chronic daily stress is enough to trigger inflammation, weight gain, and autoimmune disease. As many as 70-90% of hypothyroidism in the US may be related to the autoimmune disease Hashimoto's thyroiditis. Intestinal issues such as IBS, acid reflux or constipation -> Up to 20% of peripheral thyroid conversion occurs in your GI tract (11). Local inflammation caused by irritable bowel syndrome, small intestinal bacterial overgrowth or chronic constipation can reduce this conversion and reduce thyroid function. There's a VERY high chance that you would benefit from ​using supplements and nutrients designed to improve the thyroid status of your entire body. But how do we go about doing this? 3. Intestinal and Gut Health. ​Most thyroid support supplements focus only on providing nutrients required for thyroid hormone production (which can be helpful) but this method falls short when you consider that most of the problems relating to thyroid function occur at the cellular level. This means that most people have enough T4 thyroid hormone production, but they have issues with peripheral conversion of T4 to T3 and with cellular resistance. Your thyroid produces mostly T4 which you can consider as the inactive thyroid hormone. 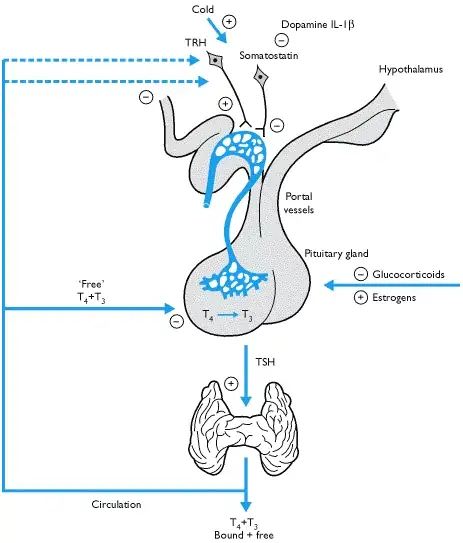 T4 is only active when it becomes converted to the active thyroid hormone T3. Converting T4 to T3 is referred to as peripheral conversion, and multiple steps are required for this process to occur smoothly. The first step is to encourage adequate adrenal function in the body. 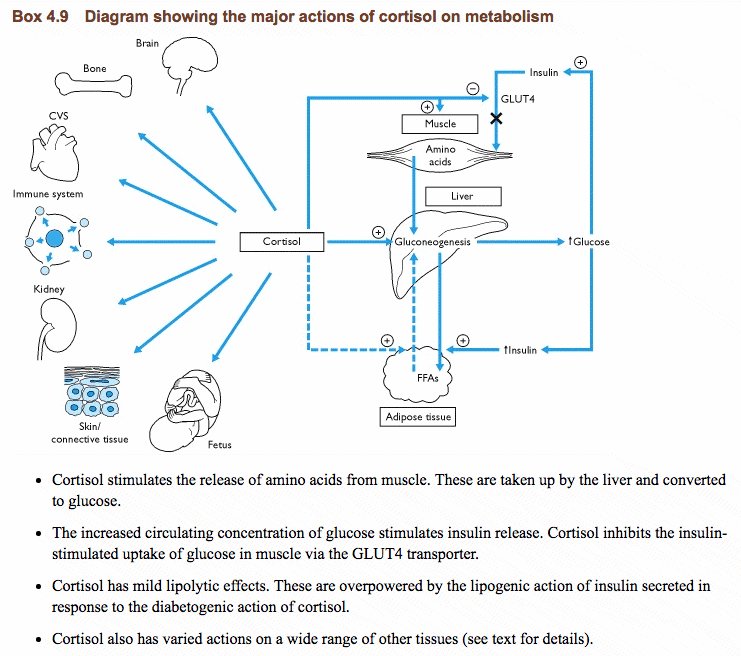 By adrenal function, I am referring to the production and regulation of the hormone cortisol. 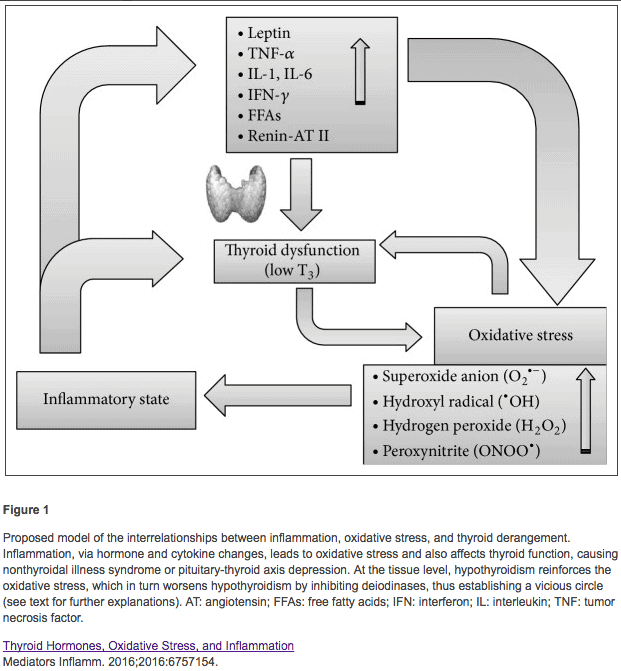 Studies have shown that both cortisol and thyroid hormone are intricately linked (12). When there is dysfunction in one there will always be some dysregulation in the other. The main issue is that simply taking thyroid hormone or fixing thyroid hormone is usually not enough to completely reverse issues with cortisol production or cellular resistance. In this case, you would need to use certain supplements and nutrients designed to complement both cortisol AND thyroid hormone production. This connection between cortisol and thyroid hormone is why so many patients with hypothyroidism suffer from fatigue and low energy. ​To combat this problem you need to use a supplement designed to help support adrenal function with nutrients that also support thyroid function. The next most important aspect of supporting your thyroid is to reduce inflammation and normalize immune function in your body. Reducing inflammation is critical for improving thyroid function because systemic inflammation reduces peripheral T4 to T3 conversion and therefore whole-body thyroid status. 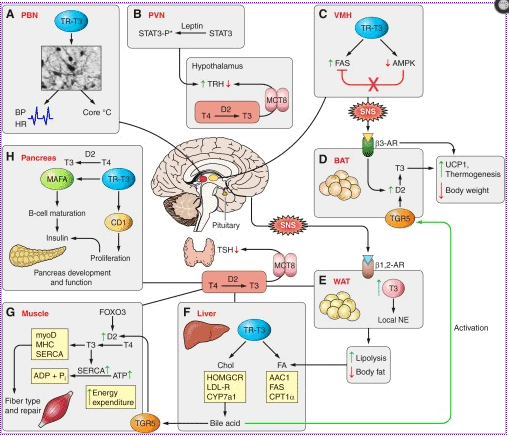 An inflammatory state also promotes hormone imbalances (13) such as leptin resistance, low T3 and increased production in inflammatory cytokines (TNF-alpha and interleukins). Beyond inflammation, we also need to concern ourselves with balancing immune function. Studies have shown that the vast majority of cases of hypothyroidism in the united states may be caused by an autoimmune disease known as Hashimoto's thyroiditis. Bad in the sense that MOST physicians overlook thyroid antibodies and tend to ignore them. But good in the sense that supporting your immune system allows a back-door approach to improving thyroid status in your body. If you can reduce thyroid antibodies in your blood then you will be doing your body a favor as you preserve thyroid glandular tissue long term (14) (sustained and untreated Hashimoto's lead to permanent thyroid damage if not addressed). ​So how do you go about reducing inflammation in your body? One of the most powerful ways to do this is to supplement with a high-quality omega 3 fatty acid. The last, and probably most important, part of supporting your thyroid is healing your gut. We already know that about 20% of thyroid conversion occurs in the gut, but so much more occurs there as well! Your gastrointestinal health is also responsible for managing your mood, balancing neurotransmitter levels, absorbing nutrients/hormones and for regulating how many calories you are going to burn/absorb. In fact, these are only a small fraction of the responsibilities that your gut has on your overall health, but they are still some of the most important. Your "gut health" is actually a nebulous and non-specific term, so when we talk about your gut we are really talking about the bacteria that live inside of it - the microbiome. To actually heal your gut you need to be using high quality and ultra-potent probiotics. I've discussed the most important aspects of taking probiotics in this post, but we will go over a few below as well. ​First: You need a probiotic which has multiple species and multiple strains of probiotics. 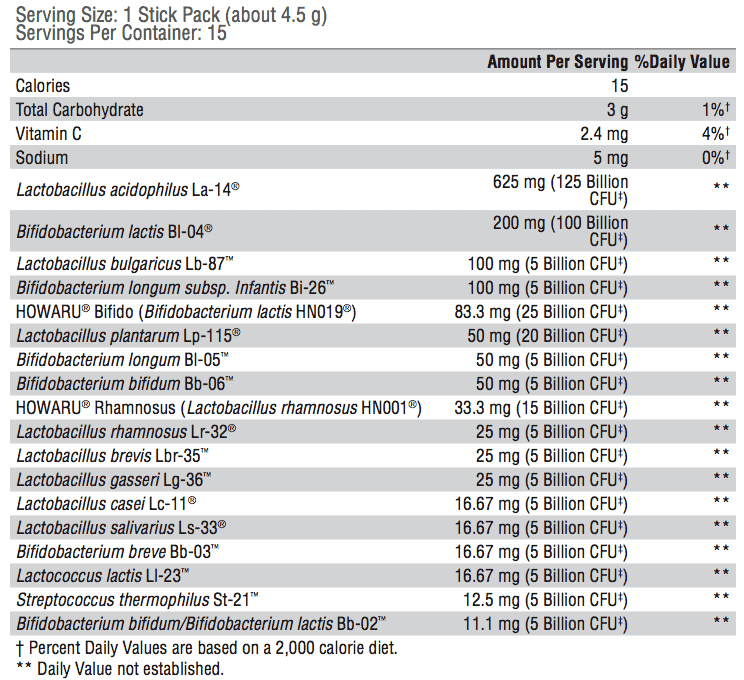 Not all probiotic strains are created equal, some are much more effective than others (16). Second: You need to make sure that your probiotic is in high enough concentration - AKA CFU's (colony forming units). Most people will need at LEAST 100 billion CFU for best results, and if you are serious about supporting your thyroid you will need 300+ billion CFU's (17). Third: ​You need to make sure that your probiotics are heat stable or that they are packaged correctly so that your probiotics survive until you can eat them! Probiotics that require refrigeration must be transported in the right conditions to ensure that the bacteria lives long enough to make it from the manufacturer to the store and then to your house. 1 packet daily x15 days then 1 packet every other day x14 days (for 2 months). After 30-60 days you should consider switching to a daily probiotic regimen. 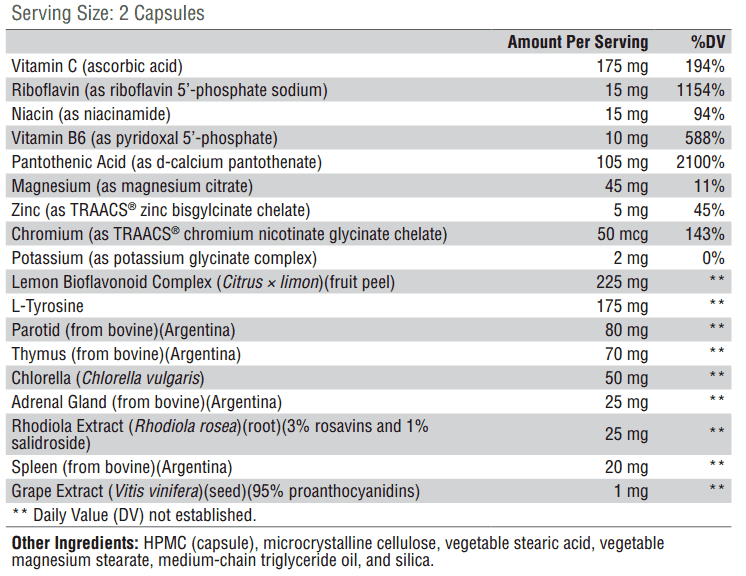 To get the best support for your thyroid you will want to combine all of these supplements. By doing so you will effectively be improving adrenal function, reducing systemic inflammation and improving your intestinal health. Taking this approach is far superior to taking 1 supplement and will seriously help reduce the symptoms of hypothyroidism. This combination of supplements will also be effective in helping with weight loss and increasing energy levels (both problems thyroid patients tend to suffer from as well). Have you tried using thyroid support supplements?